Editor’s Note: What to do with captured foreign volunteers for terrorist organizations is one of the toughest issues facing Western governments today. (See my views on a current U.S. case here.) Human rights organizations are particularly critical of governments that revoke citizenship or otherwise try to prevent their citizens from returning. Robin Simcox of the Heritage Foundation believes this opposition is simplistic. He argues the United Kingdom and other democracies are right to consider a wider range of options, including citizenship revocation and blocking individuals from returning. Shamima Begum was 15 years old when she left London to live in the Islamic State’s caliphate in Syria. Four years later, with that caliphate now all but destroyed, Begum lives in a Kurdish-controlled camp in Syria. Begum has told reporters that she does not regret her decision to join the Islamic State. Nonetheless, she has asked to return to the U.K. Some commentators have called on Home Secretary Sajid Javid to return Begum to the U.K. and then prosecute her. However, the U.K. has struggled to jail returning foreign fighters without strong evidence that they participated directly in fighting or planning attacks. While over 400 of the approximately 850 fighters from the U.K. have returned from Syria, only around 40 have been convicted. Some Syria-related prosecutions have also collapsed at trial. With such limited success for prosecution, the U.K. has had to innovate. The path currently being pursued with Begum is to remove her citizenship. The home secretary has done so on the basis that, despite her being born in the U.K., Begum’s parents are Bangladeshi and she could qualify as a dual national. Begum’s lawyers have appealed the decision, and for its part, the Bangladeshi government has stated that Begum has never applied for dual nationality nor visited Bangladesh—but it has also rejected the notion of allowing her to live there. Begum’s case is complicated and contentious. Some British Muslims have called the government’s reluctance to let her return racist and a betrayal of values. Moreover, they’ve outlined fears that the policy applies only to people of color and relegates Muslims to being “second-class citizens.” However, the approach taken by Javid is not unprecedented. The U.K. government has taken this stance on citizenship in the past and should retain the ability to do so again in the future. Javid recently disclosed that the government has used these powers to remove citizenship from approximately 150 individuals since 2010. Use of this power has increased since Syria became a magnet for foreign fighters. Within this 150, there are occasional examples of, as with Begum, these powers being applied to individuals born in the U.K.
One case involved an entire family: The U.K. government believed a British-born man from Newcastle and three of his sons were members of Lashkar-e-Taiba. Their citizenship was consequently revoked in March 2011. All were in Pakistan at the time, where they are believed to remain. In other instances, individuals whose citizenship was stripped were later targeted in counterterrorism operations. Mohamed Sakr was born and raised in the U.K. In October 2009, he journeyed to Somalia with Bilal al-Berjawi, a Lebanese-born British citizen. According to a British Court of Appeal document, the two men were traveling “for the purpose of terrorist training and terrorist activity.” Berjawi and Sakr were closely tied to Fazul Mohammed, Osama bin Laden’s hand-picked choice to lead al-Qaeda in Somalia. The British government revoked Berjawi’s and Sakr’s citizenship in September 2010 “on the grounds of conduciveness to the public good.” In January 2012, Berjawi was killed in what was reported to be a U.S. drone strike near Mogadishu. Sakr was killed in the same manner a month later. Although Begum’s case is by no means unique, it has been front-page news. 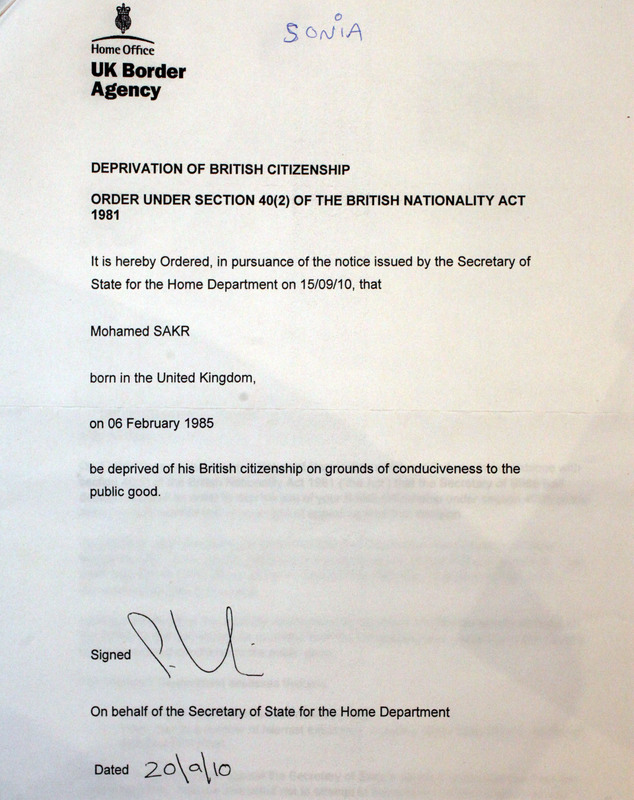 Revocation of her citizenship has caused controversy in the way that Sakr’s, for example, did not. Some of the criticisms of the government’s decision have been compelling. As some critics have noted, Bangladesh should not be responsible for cleaning up the mess caused by the U.K. It is also legitimate to imagine what a radical home secretary could do with this power. For example, in the Jewish Chronicle, Stephen Pollard argued that a Jeremy Corbyn-led government could use the same power to strip Jewish British citizens of their nationality if they enlisted in the Israeli Defense Forces. This is a legitimate concern, but it is tough to know what the logical end point of this line of thinking is. Should the British intelligence agencies MI5 and GCHQ and the British military also be gutted because a demagogic leader could use them for nefarious means? It is better for the U.K. to pursue the most expedient policy of citizenship revocation while also ensuring that the checks and balances in the system are robust enough to prevent abuse of the process. Those checks and balances are first and foremost the British electorate, but also the various levels of courts. However, not all the arguments criticizing the government have had much weight. For example, Moonshot, a nongovernmental organization (NGO) that works on countering violent extremism, has claimed that barring Begum’s return is actually “dangerous” and makes the U.K. “less safe” because it “reinforces the recruitment narrative.” This argument seems spurious. If the U.K. government’s preventing an Islamic State recruit from returning to the country is what persuades some wavering jihadis that the country really is an enemy to Islam, then chances are they would have found another reason to justify this viewpoint somewhere else down the line. Furthermore, if the U.K. government confined itself to policies that the NGO community said would not reinforce the recruitment narrative, it would be left with virtually zero policies. Begum has suggested that she could be repatriated to the Netherlands as an alternative to the U.K. because she married a Dutch jihadi while in Syria. However, Islamic State-sanctioned marriages are not legally recognized in Europe. The Netherlands, which is not eager to accept more jihadis, is unlikely to accept her. Begum has said that she is unwilling to go to Bangladesh, and that country is presently unwilling to take her. Instead, Begum and her family in the U.K. have appealed the government’s decision. This case will likely be heard at the Special Immigration Appeals Commission, a closed court convened when home secretaries wish to introduce information they do not wish to be made public for national security or diplomatic reasons. The government’s arguments are usually successful in such courts. If Begum were to return to the U.K., it is uncertain—though possible—that she could be prosecuted for membership in a proscribed organization. Even without a case against her, though, Begum could be placed under a terrorism prevention and investigation measure. Among the measures possible are a curfew, an electronic tag, prevention from communicating with certain people and attending certain mosques, potential relocation and being barred from using certain technology. No matter what course of action the government chooses, it should not be regarded as a meditation on the state of our British souls. Many democracies are having to wade through an unprecedented morass caused by the rise and fall of the caliphate. Not every country will make the same choices; different approaches may be better suited to different contexts. If the U.K. government could be confident that Begum could be prosecuted and jailed for a long time, perhaps the case for allowing her to return would be more compelling. However, as that is an unlikely scenario, she should not be allowed to return to the U.K. Yes, Begum was only a teenager when she left the U.K., and many teenagers make mistakes in their youth. However, not many join a genocidal death cult.